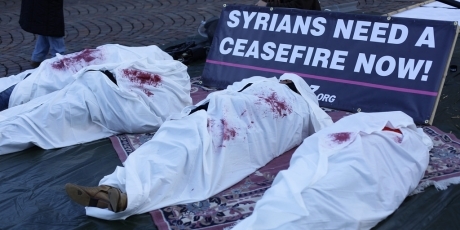 A letter from a Syrian Avaaz member as Syrian peace talks continue in Geneva. I am from Homs, Syria -- a city under siege, where children and babies have been tortured and bombed. It is hell on earth, and it is hard to have hope, but right now I see a chance and I am urgently calling on everyone to help. In 48 hours, for the first time ever, all the major powers behind this war are going to meet. All parties say they want to hear the Syrian people's demands, and they want to show their own public they are doing something. So here is how we get 'a seat at the table' -- we commission a Syrian opinion poll, set up a live feed from Syrians to get clear demands presented to negotiators at the talks, and a million of us from across the world back the call for a ceasefire. Let's be clear: this is a war on civilians. The Assad regime has not only dropped chemical weapons on whole communities, it has laid siege to entire regions, like my own, shelling day in and day out and denying the entrance of food. Families in my city are being starved to death while two regional powers, Iran and Saudi Arabia, pump weapons and cash to fighters on both sides. These countries have converted a peaceful, popular revolution into a nightmare proxy war hijacked by radicals. My home is now their battlefield and my people the victims. And they will both be at the table on Wednesday. I joined the Avaaz team over a year ago, when this community raised funds to send communication equipment to brave Syrian democracy activists. I remember the incredible gratitude I felt for this community of people that made it possible for the world to hear our cry for help. Now I’m asking you to urgently help my fellow Syrians once more to ensure the world understands that the majority of Syrians just want food, and a night without snipers and a plan that could help lead us to peace and democracy.